I don’t know about you, but I am a bit of a clean freak when it comes to my sleeping arrangement. But even if you’re not a clean freak, I’m sure we can all agree that nobody wants to risk any unnecessary bed bug or mosquito bites. Sleeping bag liners come with so many benefits that by the end of this article you’ll be asking yourself why you don’t have one yet. This article will review 15 great sleeping bag liners and then talk about what to look for when choosing the best liner for your needs. How to Choose the Best Sleeping Bag Liner for Your Needs? 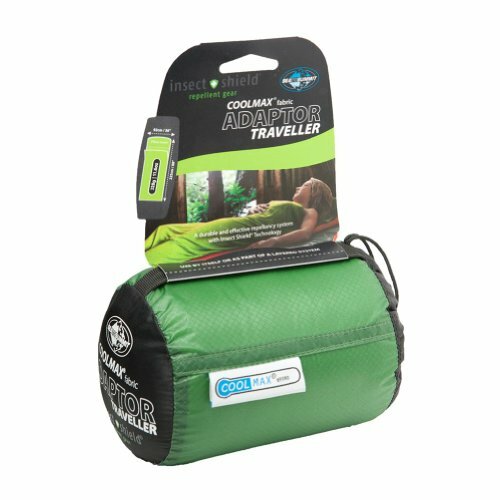 The Cocoon Silk MummyLiner is the best silk sleeping bag liner for travelers, being versatile and compact. It can be used with or without a sleeping bag, will keep you warmer in cold weather and cooler in hot climates while providing some protection against insects. This silk liner is machine washable and will dry quickly for convenient hygiene on the road. Made of Ripstop silk, it is extremely durable. It is zip free which means it packs down smaller and lighter than liners with zips. This silk liner is the most compact and light weight option. Some people may find the mummy shape restrictive around the legs. This liner is perfect for going inside a mummy shaped sleeping bag, is useful in hot or cold climates and packs down to almost nothing. 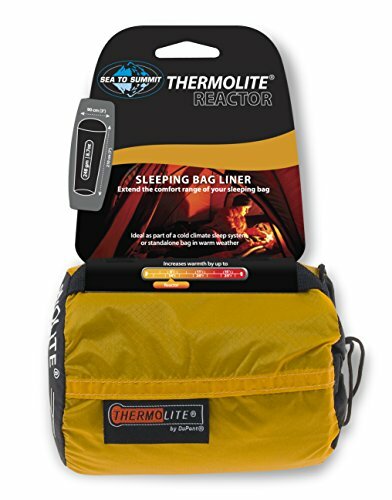 Therm-A-Rest are renowned for their top of the line sleeping equipment and this liner is no exception. Made of brushed polyester, it is very soft, cozy and warm while remaining light weight. The ¾ zip makes getting in and out a little easier without adding too much to weight and bulk. It has sewn in loops that are compatible with Therm-A-Rest sleeping bags to hold the liner in place so it doesn’t bunch up. Machine washable and packs down to the size of a 1 L bottle. A little bulky when packed. This is the best sleeping bag liner for warmth in cold weather, adding an estimated 5’F/3’C to your sleeping bag. Designed as a liner for double sleeping bags, this is a great option for travel in warm places where you can get away with just the liner. The double size is perfect if you prefer a little extra leg room and not to be confined to a single sized liner. Estimated to add 10’F to all double sleeping bags for use in cooler weather. A versatile sheet to be used by itself in hostels and as a blanket on the plane. Made of machine washable, brushed poly-flannel which is soft and comfortable. Not compatible with solo sleeping bags. This is the best sleeping bag liner for use in hotels and hostels or with your partner. Rab are a very well respected UK outdoor brand so you can be sure that all of their gear is top of the line. They have liners of different materials to choose from including silk and cotton as well as this polycotton. 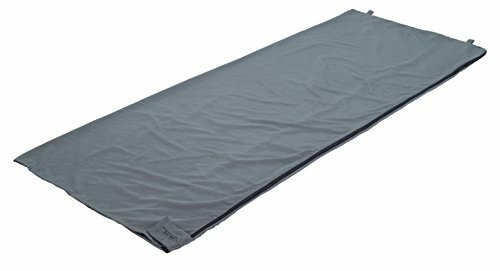 The 36”x78” standard sleeping bag size rectangle is a simple, functional design with nothing to go wrong. No zips or Velcro mean this is a light weight and compact liner. Guaranteed to add warmth to your sleeping bag. This size will be a little small for some people so check the dimensions will suit you before you buy. 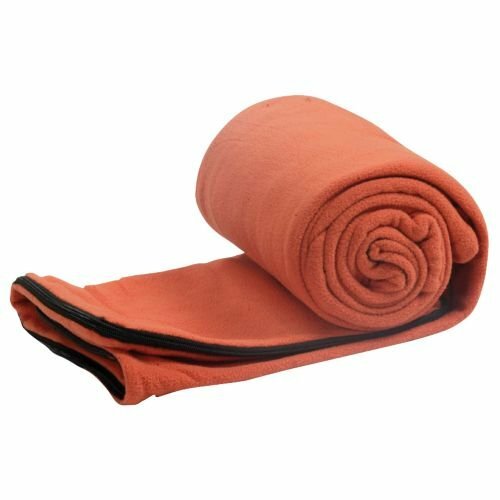 This is a simple, affordable and yet very good quality sleeping bag liner that is suitable for use by itself in warm weather or for extra insulation in cold weather. 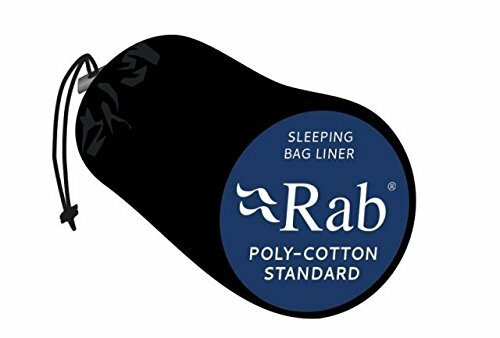 Rab’s silk version of this liner is the best ultralight sleeping bag liner, weighing only 3.6 Oz. This is another great value sleeping bag liner that will be your best friend in all climates, in a sleeping bag or hostel bed. It is larger than a standard sleeping bag liner so gives you a little more space to move, and packs down extremely small and light. 41”x86” dimensions are generous giving you extra wiggle room. Has a slit side with Velcro closure for easy entry and a sleeve for a pillow. Packs down to a tiny 6”x8” and weighs only 8.35 Oz. Hard to find any cons for this liner! 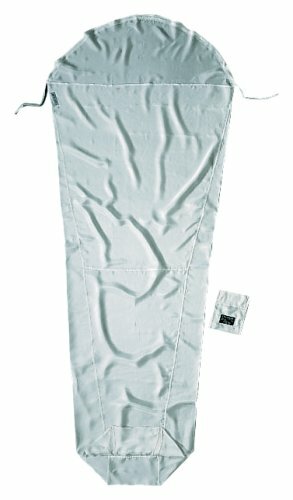 This is the best sleeping bag liner for backpacking through warm countries where you want a clean sheet to recline on. This fleece sleeping bag liner is an excellent option for travelers on a budget who want something a little warmer than a standard liner. It can easily be used as a summer sleeping bag by itself and adds a decent amount of warmth to your sleeping bag in cold weather. The fleece is soft, warm and cozy, estimated to add 12’F to your sleeping bag. Multiple bags zip together to make a double fleece sleeping bag for two people. It can also be unzipped completely to use flat as a double sheet or blanket. May feel a little bulky and take up space in your sleeping bag when used as a liner. Not a light weight bag so be prepared to carry a little extra weight. This is a cozy and comfortable sleeping bag liner, but what you gain in warmth, you lose in space! This cozy microfiber brushed polyester liner is designed for rectangular sleeping bags but can also be used by itself or as a sheet making it versatile for travel. Can be completely unzipped to use as a flat sheet. The material is moisture wicking and quick drying. At 1 lbs. 5 oz. this liner is a little on the heavy side. Material is not as soft against the skin as some other liners. 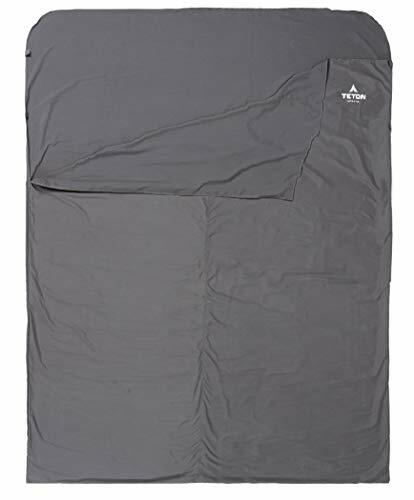 This is a good quality, good value sleeping bag liner. It’s perfect if you’re looking for something affordable and durable. This is the sleeping bag liner you’ll want for colder climates, effectively adding an extra season to your sleeping bag. But it is also a great choice for a standalone sleeping bag in warm weather. It is a mummy bag shape and comes with a drawstring around the head area for extra insulation. Likely to add an impressive 14’f of warmth to your sleeping bag. Packs down small and weighs just 8.7 oz. The stretchy, soft material is comfortable and doesn’t feel restrictive. 100% polyester Thermolite material is durable and easy to wash.
It’s hard to find any cons for this liner. This is the best thermal sleeping bag liner and so the best sleeping bag liner for cold weather. This sleeping bag liner is designed for mummy shaped sleeping bags but can be used on its own in warm weather too. It is a simple cocoon shape with a flap that goes over the pillow area. 100% Polyester microfiber is fully machine washable. Simple design is light weight, compact and with no fiddly zips to worry about. No side opening so entry is through the top only. This sleeping bag liner is a failsafe option for use as an extra layer of moisture wicking insulation in a mummy shaped sleeping bag. This versatile sleeping bag liner is designed to excel in all climates, keeping you warm, dry and safe from insects. It is a mummy bag shape with no side opening so it requires shimmying into from the top. The lack of zips or Velcro means it packs down small. The Coolmax fabric is moisture wicking and stretchy making for an extra comfortable sleep. Comes pre-treated with permethrin that will last about 70 washes to give extra protection against insects. 6 Oz. is a little on the heavy side. 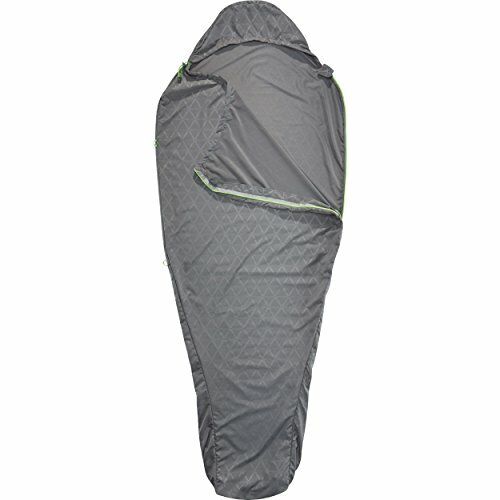 This is easily one of the best sleeping bag liners on the market for its durability and versatility in temperature. 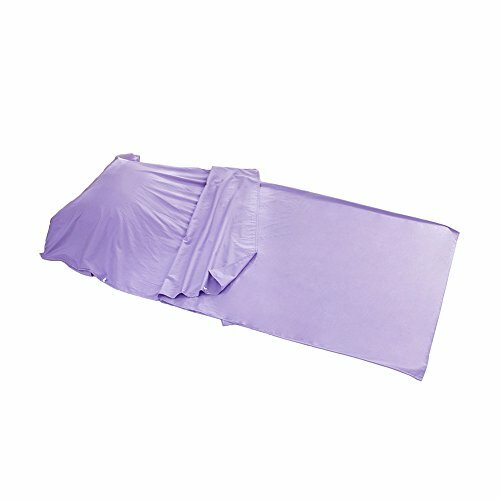 This is a rectangular silk sleeping bag liner with a pillow sleeve and slit on one side for easier access. 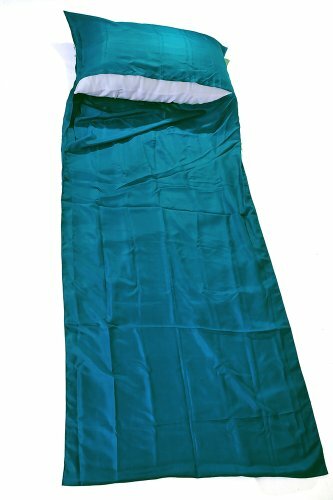 Made of 100% silk, this sleeping bag liner is ideal for hot weather and use in hostels in hot countries. Very affordable for 100% silk. It will help to keep you warm inside your sleeping bag in cool weather but keep you cool in hot weather. Packs down to 9”6.7” and weighs around 4 oz. The color may bleed the first time you wash it. 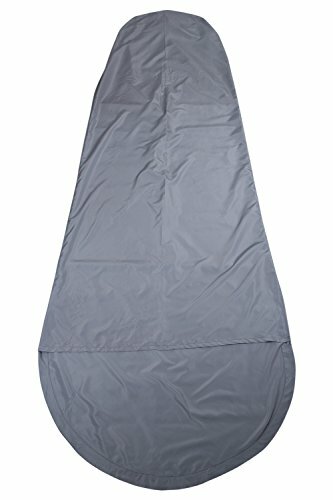 This is an affordable silk sleeping bag liner that will be a useful addition to your luggage while not taking up too much space. 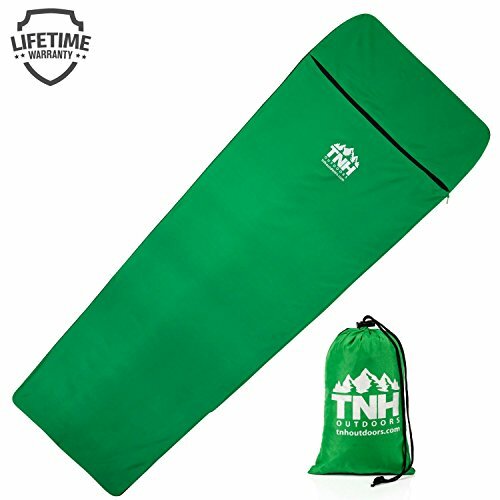 THN Outdoors Sleeping Bag liner is a mummy shape that lines your sleeping easily to keep it clean and provide a little extra warmth. Full length zipper makes for very easy access. Made of microfiber polyester which is soft, durable, warm and cozy. Its larger size makes it ideal for use by itself in warm weather or hostels. 10 Oz. is on the heavy side for a liner. A little too big to fit comfortably in most sleeping bags. This is the liner for you if you’re on a budget and appreciate a liner with a full length zip. This incredibly low priced liner is a good example of when budget options can be just as functional. Tough Outdoors’ sleeping bag liner is comfortable, durable and packs down into a very small, lightweight package. 85”x37” is a good sized liner. Made of 100% polyester that has a soft silky feel. Packs into 6”x8” case and weighs 11 oz. This liner is amazing value for something that packs down so small, so it’s a great option if you’re still deciding whether a sleeping bag liner is something you want to travel with. 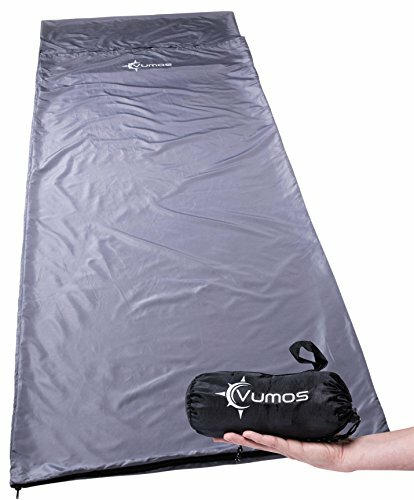 The Vumos sleeping bag liner is very versatile. 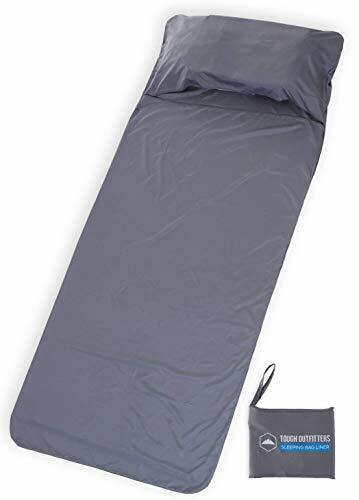 Its full length zip allows it to open out into a flat sheet for use on a double bed or with 2 people, but it can also be used by itself or inside a sleeping bag. The 100% polyester fabric has a silk finish which is soft and breathable. The sheet has a pillow pocket where you could stuff a rolled up jersey for a DIY pillow on the road. It packs down to 7.5” and 11.5 Oz. The rectangle shape may be uncomfortable if used in a mummy shape sleeping bag. 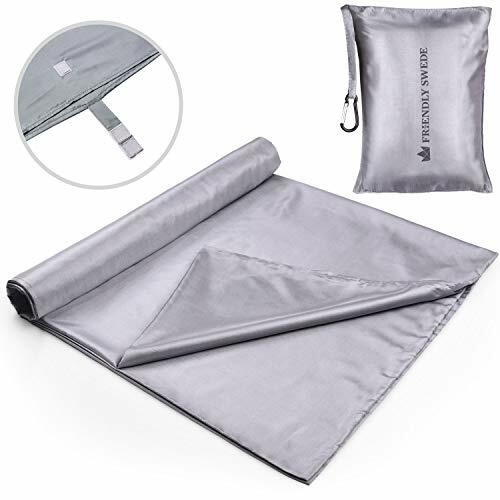 This is an affordable, versatile sleeping bag liner, that doubles as a sheet so is a great option for travel. This is less of a sleeping bag liner and more of a sheet for use in hostel situations which makes it a great option for travel. It is effectively a sheet that has been sewn partially shut into an envelope and with a pillow flap. It comes in 3 different sizes to suit singles and couples. Made of 100% cotton, this sheet is easy to wash. It comes with a pillow flap for slotting the hostel pillow into if you don’t trust the pillow cases. This sheet won’t add any warmth and isn’t really suited for use inside a sleeping bag. This is the perfect sheet to carry with you if you’re going to be staying in hostels where you can’t guarantee the cleanliness of the bedding. Sleeping bag liners are a super useful item to travel within my option. They are very versatile and don’t take up much space in your luggage so I can’t think of a reason not to carry one, given all the benefits. For example, a good sleeping bag is expensive and you’ll want to avoid washing it too much in order to prolong its life. A sleeping bag liner means that you can keep your sleeping bag clean and not have to wash it, by washing the liner instead. A good sleeping bag liner can also add a season of warmth to your sleeping bag, making a good 3 season bag capable of withstanding winter temperatures. Some liners are also moisture wicking, helping you to stay dry and warm. When traveling in hot places, the sleeping bag liner can take the place of your sleeping bag completely. I can speak from personal experience having done this for 3 months in South East Asia. And finally, there’s the hygiene factor. Sleeping bag liners can provide you with a clean surface to sleep on when you’re not completely sure about the cleanliness of your lodgings. They also help to prevent bites from bed bugs and mosquitoes (though this depends on the material). But, there are different kinds of sleeping bag liners. So you’ll need to decide which factors are important to you. This is a personal preference and depends on how much leg room you need. If you want to use your liner inside your sleeping bag, you’ll want something a little smaller/less bulky. If you’re a taller person, you may need a longer liner. Do you mind shimmying in through a top only entry or do you need a side opening? Zips can be handy for easy access but take up space when packed and can be more hassle than they’re worth if they tend to snag. This is actually probably the most important factor. Sleeping bag liners can be silk, cotton, polycotton, polyester or fleece. Silk is the most expensive, but it is the most versatile in hot and cold temperatures, it packs down to the smallest and lightest package, and it doesn’t need to be treated against insects as bed bugs and mosquitoes can’t penetrate the fine mesh (although there will be nothing stopping them from entering at your head end). Fleece can be cozy and warm but will be bulkier. Cotton is usually heavier and once it gets wet, will stay damp and not help to keep you warm. Polycotton or polyester can be a great choice depending on the quality, basically being a combination of fleece and silk in properties. Waterproof sleeping bag liners are not very common, as waterproofing adds weight and bulk, and reduces breathability. But if it’s something you’re really determined to find, Brolly Sheets do a waterproof sleeping bag liner that is about the size and weight of a flannel sheet when packed. So that concludes this article on the best sleeping bag liners for travel. I believe sleeping bag liners can be a really great addition to your travel gear, especially if you choose one that is light and compact. Feel free to comment below, and if you haven’t already, be sure to download our e-book on solo travel safety. Hennessy Hammock vs. ENO Hammock – Which One is for You?